Would you ever visit an art gallery under the sea? 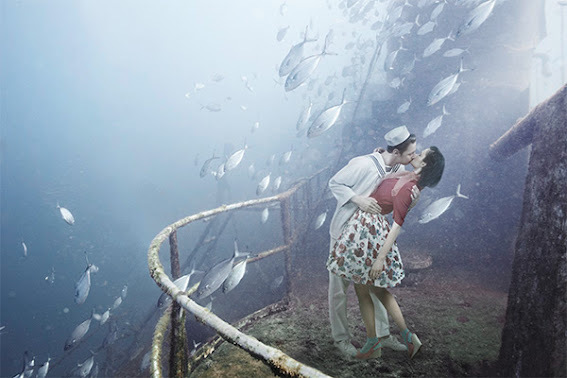 The USS Mohawk, a World War II warship turned artificial reef off the coast of Sanibel Island in Florida, is currently hosting the works of photographer Andreas Franke. For his latest underwater experiment, titled Mohawk Project, Franke has installed 12 images within the sunken ship's inner spaces. 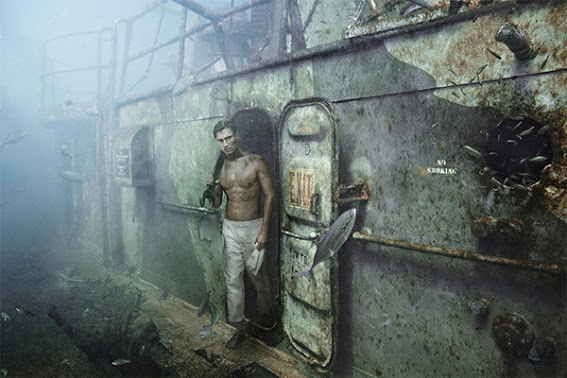 He imagined what life would have been life for the sailors aboard the ship and superimposed images of models in 1940s clothing onto haunting photos of the decaying ship underwater. The 2.5 by 3.5-foot-long images - each of which is encased in steel-framed plexiglass - will also grow to inhabit marine life and transform over the next three months. Divers exploring the Gulf of Mexico will get to enjoy the view surrounded by whale sharks and exotic fishes until Sept. 15. Afterwards, those of us who prefer to remain firmly planted on solid ground can view the photographs when they're put on display at the Lee County Alliance for the Arts galleries in Fort Myers, Florida from Oct. 4th through the 26th. Between 1942 and 1945, the USS Mohawk launched 14 attacks against enemy subs in the Atlantic and rescued more than 300 survivors from torpedoed ships during WWII. "I imagined these sailors waiting in the North Atlantic for a German sub to attack them," Franke told CNN. "So in these images I tried to make their lives a little bit nicer with the girls on board." "If I was there, what would I want? It's a dream, a fantasyland for sailors." Now that is really wild - and most creative!